Q Why do the Japanese sometimes cry at graduation? A The Japanese do not feel secure being out of a group. 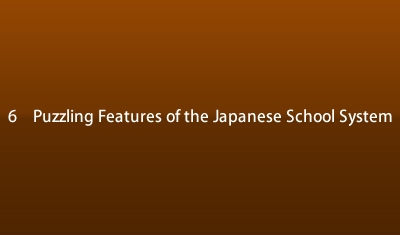 They refer to their company as uchi no kaisha (our company) or to their school as uchi no gakko (our school). Uchi means "being a pmt of' or "our/my" in this case. One would still call one's affiliated group as uchi or "our" even if one is not promoted at all in the company or even if there are bullies at school. As a member of the group, the Japanese try to get a long with the other members by showing restraint in not doing anything that would displease, but rather, by doing things that would please the other members in the group. A sense of camaraderie develops as a result. Graduation is a time to part from one's fellow class-mates, in other words, a dismantling of the group. Although the friendship of close friends formed within the group would still continue in the future, the dismantling of the group cannot be avoided. A certain sentiment prevails that is intensified by the song, "Auld Lang Syne" and TAKEDA Tetsuya's (with the Kaientai Band) "A Message for You." The mood builds up to a height and is released in tears. A graduation ceremony is called commencement in Engli sh and its original meaning is, " to begin." Embarking on a new life is filled with hope and anxiety for what the future may hold. There is no reason to cry about it. There are basic differences in the way Americans and Japanese view graduation.